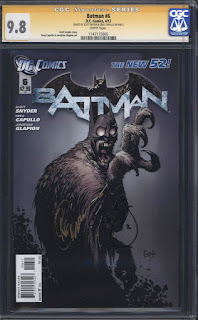 I had intended to post the first full appearance of The Court of Owls sooner, but as I was doing some research, I ran into some conflicting information. Most of the sites I went to stated that Batman #2 had their first appearance, while others stated it was in Batman #5. There was one other site that stated it was in #6 . Which one should I believe? Ultimately, I ended up finding some copies of the new Batman series, and read them for myself. This cleared up any confusion for me about which issue had The Court of Owls first full appearance, and as it turns out, it's this one. Let me explain why I made the decision to label this as their first full appearance and not issue two. All of the websites that state that issue two has the first appearance are wrong. In issue #2, The Court of Owls are only mentioned in a conversation between Batman and Commissioner Gordon, they are never actually shown. So, in my opinion, the issue #2 key issue notes should be "First mention of The Court of Owls", not their first appearance. 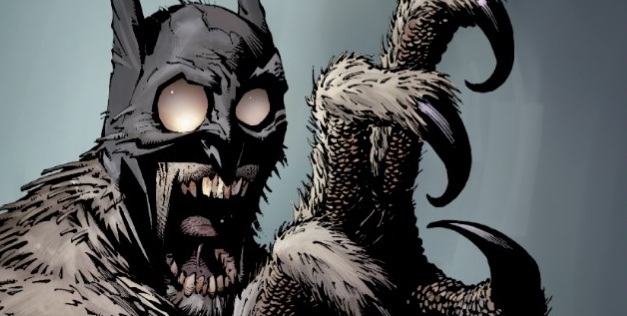 The Court of Owls are never actually shown in issue #5 either. This issue merely has Batman slowly going mad as he's wandering through a giant labyrinth, and being followed by The Court of Owl's deadly assassin, named The Talon. There is, what I consider, a small cameo appearance in Batman #3. As Batman is searching through the hidden lair of The Talon, he comes across some pictures of the them hanging on the wall. They are clearly shown in two panels of this issue, but it's not until issue #6, that we finally get to see some members of the Court of Owls. Who are the Court of Owls you ask? That is an excellent question. They are a secret criminal organization, created by the writer / artist combination of Scott Snyder and Greg Capullo, that has ruled over Gotham City for hundreds of years, since the city's inception. They'll murder and bribe in order to gain political influence. They are the most powerful group in Gotham, even more powerful than the mighty Wayne family. There are a mucho amount of copies of Batman #6 out in the world. It has an estimated print run of about 128,500, but surprisingly there are very few copies that have been graded by CGC. To date, not counting variant covers, there are only 135 copies listed in their census. If you count the variants, there's a total of 320 copies graded, which is still low. This could be due to the confusion of which issue The Court of Owls first appearance is actually in. Batman #2, which most sites have listed as their first appearance, has well over twice that number in the census. Anyway, of the 135 copies listed, well more than half of those are graded 9.8 NM/M. High grade 9.8 NM/M copies have started to see a nice increase in value recently. A couple of the latest sales have gone up over the $100 mark. This could go even higher when CGC or CBCS start to recognize the key issue status of this comic. But when that happens, people will start flooding grading companies with their copies, and then there will be an over abundance of high grade copies in the market. That could drive values down, but maybe not. I can't tell you that for sure, my crystal ball is in the shop right now. However, now might be a good time to pick this issue up before it's widely known as the Court of Owls first full appearance. It might be a good book to flip and make a few bucks on.